Centsible Savings: CVS FREE gas promotion – earn $10 in free gas each week! CVS FREE gas promotion – earn $10 in free gas each week! Here is some great news to help you will the rising gas costs. CVS launched a new FREE gas program where shoppers can get a FREE $10 gift card to Exxon/Mobil, Shell, BP Amoco or BP Arco every week by spending $30 on specially-marked items found in the weekly CVS ad. The qualifying products will change each week and should will be marked with a “get free gas” tag. Your $30 total is before coupons are deducted. So you can use coupons to reduce the amount you will actually pay (super excited about that!) Once you reach the $30 minimum purchase total each week, a special coupon will print on your receipt that can be redeemed immediately in store for a $10 gas card. You can purchase your items in different transactions (the bottom of your receipt will keep track of your running total.) BUT your total will not carry over to the next week so make sure get to your $30 total in by the end of the week. Here’s the rest of the rules: the coupon must be redeemed within 30 days for the gas card, so you might want to just go ahead and get it right then. You can only earn and redeem one coupon for a $10 gift card per week. 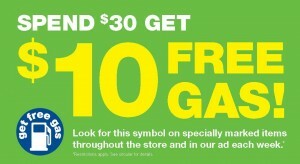 Promotion runs May 22 - August 28, 2011. I will post a separate CVS FREE gas post each week with the participating products each week and coupon matchups.